So... we've finally reached our last (proper) meal in Taiwan on this trip. The Great One and I were only able to catch up with our friend J for (literally) a few minutes in Bangkok a few months ago. Since we haven't spent enough quality time with him in a while, I told him that the Great One was coming to Taipei for her first visit since the Dark Ages. The next thing I knew, he went through the trouble of rearranging his schedule so that he could be in town to take us to one of the restaurant he owns. STAY has become our family's favorite restaurant in the last couple of years, and it's the place where we go to celebrate birthdays and my parents' anniversary - which we last did 2 months ago. Since our last visit, STAY has welcomed their new Executive Chef Pierrick Maire, so we would have the privilege of previewing some of his new dishes. Raw mackerel with parsley and hibiscus jelly - there was a dab of parsley purée along with some shiso (紫蘇) leaves and shiso flowers on top of the mackerel. The sauce on the side was tomato confit, but it tasted a little like ponzu (ポン酢) reduction. More acidity came in the form of the roll of hibiscus jelly, coated in sesame seeds. Pretty refreshing, and the acidity kinda whets the appetite. Baby pork ravioli with raw and cooked baby vegetables, honey foam - interesting to find diced tomato inside the ravioli with pork. Lots of spring vegetables like multi-colored carrots, tomato, zucchini, and asparagus... etc. Apparently the baby pigs come from the hills around Taipei. Pretty delicious. When noticed the wheel of Parmigiano-Reggiano next to our table when we were seated, and it became apparent now why this was on the tray... Chef Pierrick was gonna finish cooking our risotto on it! First some Brandy was poured on top of the wheel and lit, and the chef slowly stirred the burning liquor and spread it around, letting the heat soften the hard cheese. After the softening process finished, the chef used the spoon to scrape off the soft cheese. The cooked risotto was then put on top of the wheel and thoroughly mixed with the cheese, before being served to us. Risotto with bean sprouts and mahi-mahi - the mahi-mahi was cooked with armagnac, butter, and lemon. It was delicious, but ever so slightly on the dry side. The risotto - despite having plenty of Parmigiano-Reggiano mixed in - was cooked with soy sauce and bean sprouts. A very Asian twist, and I wondered whether the chef developed this while he was at STAY Beijing. USDA Prime beef cap with truffle macaroni, asparagus, tomatoes - I love this cut of beef as it's just really tasty. The truffle macaroni was nice, too. Perfect doneness. The French do know how to handle a piece of beef. I've always loved this place for their dessert ribbon, and while the most I've ever done was two of these, today we were treated to three of these babies by Head Pastry Chef Alexis Bouillet. That's a pretty impressive sight! Vacherin with raspberries and lime, vanilla cream - very refreshing and delicious. Mandarin - a signature at Ledoyen, and this was very, very tasty. Vanilla raspberry choux - raspberry coulis inside the vanilla cream. Yum. I brought along a bottle to share, and J very kindly offered a white Burg for us to start. 2012 Benjamin Leroux Puligny-Montrachet 1er Cru Champ Gain - lemon citrus, some ripeness in the nose, buttery, toasty, flinty and mineral. 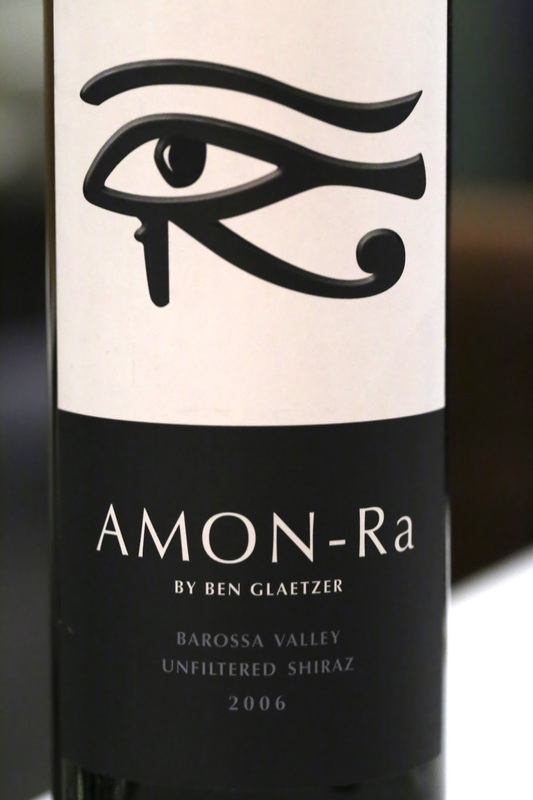 2006 Glaetzer Amon-Ra - very big vanilla and oaky nose. Classic Aussie Shiraz. This was a pretty good meal. I look forward to seeing the change of menu here, and will certainly be back with the Parental Units later in the year. Many thanks to J for the delicious treat.